Check the Fien Print: MovieWatch: "Blood Diamond"
In a Nutshell: If Ed Zwick had a Barbie Dream Actor, it would probably be Djimon Hounsou. Just a hunch. Zwick has made a filmmaking career out of heart-tugging, action-oriented Important Dramas about white men in alienating environments learning Important Lessons. Hounsou has made an Oscar nominated acting career out of playing spiritual guide to alienated white men. Zwick meet Hounsou. Hounsou meet Zwick. Now give us free! 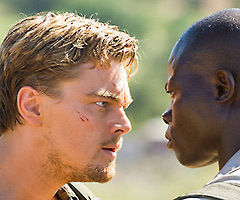 Zwick and Hounsou's first pairing, "Blood Diamond," is a well-meaning and old-fashioned yarn with just enough adventure and violence for the steak-eaters and just enough politics and family pride for the tree-huggers. Cast Robert Mitchum or Humphrey Bogart in the Leonardo DiCaprio role and Deborah Kerr or Katharine Hepburn in the Jennifer Connelly part and John Huston could have made the heck out of this movie in 1953. The problem is that they don't really make movies like this anymore, so Zwick is frequently clumsy. He never lets the actors, the plot or the narrative take priority over a well-composed valley vista or a breath-taking sunset (kudos to Eduardo Serra's gorgeous cinematography). The central romantic pairing is implausible and badly integrated into the plot, with Zwick slamming on the breaks to give Connelly and DiCaprio pleasing glamour shots between scenes of poverty or bloodshed. "Blood Diamond" gets engulfed in sentimentality well before its predictable ending, and goes through five or six fake endings before the credits role (over a truly *awful* Nas composition). But I wasn't bored and, unlike the movie I saw yesterday, I didn't leave feeling like I'd been emotionally violated. Bravo! wow, you're on a roll! can hardly wait for your _last king of scotland_ comments tomorrow! these two reviews are good, though -- inasmuch as i agree with everything you write about _blood diamond_ and _babel_.